Have you ever been to a place that is so beautiful you cannot even comprehend its existence? A place that leaves you speechless? A place that makes you wonder about the people who live there and how this is their reality? The Aran Islands off the west coast of Ireland is one of those places for me. Imagine an island of stunning cliffs, rocky horizons and hidden trails only accessibly by boat or plane. Paved roads are few and narrow and travel by bus is a bit terrifying and limiting. But the endless wonders of the islands open up if you travel by foot or by bicycle. So on my second visit to Inis Mor, the largest of the Aran Islands, I was eager to rediscover one of my favorite places using my favorite mode of transportation… the bicycle. As soon as my family and I disembarked the ferry boat from Galway, I headed straight towards the bike rental place and noticed a disheveled group of young travelers congregating on the docks. Taking a closer look, I immediately recognized the one and only Dave! Dave was my Shamrocker tour leader from last year and by some crazy coincidence my return to the Aran Islands coincided perfectly with his group. How crazy is that??? While my mom hopped on a bus for a separate tour, the rest of us rented some swanky bicycles, following the Shamrockers to the same grocer from last year. We loaded up our bikes with snacks and sandwiches and took off along the ocean, pedaling up the treacherous hill I remembered from before. Unfortunately the path did not agree with me yet again and I fell off my bike, jamming the tire into my leg and busting a spoke loose. At least I didn’t pop a tire… yet. With my bike out of commission, we continued by foot on up the rocky trail with Dave and the other Shamrockers. At the top of the hill we were assaulted by the same incredible view I remembered from so long ago. The sun was back out with a vengeance as we walked to the edge of the earth, the vertical cliffs of Inis Mor. Remember this view? Nothing had changed at all, including my crippling fear of heights which my sister and Stephen apparently do not share. Though I did try some stunts a safe distance from the edge. I still have some sense of adventure. We hung out at the edge for a while, chatted with Dave, ate lunch and walked down to the old stone fortress. The sun was warm but the wind was fierce, driving a constant stream of cold air at our faces. But we were reluctant to retreat from the spectacular views, content with chilling in the presence of blue waters and rocky cliffs. Sometimes we must suffer for beauty. Although I wouldn’t consider this a face of suffering. Look how happy I was! So happy to be back and sharing this special place with my family. After a good while spent worshipping the sun on the rocks, we headed back down the gravelly road towards the center of town on our bikes. Unfortunately Stephen popped his tire! Whelp. So we half walked, half rode our bikes back towards the rental shop and enjoyed the scenery. I found some beautiful lobster traps… or are they fish traps? Honestly I do not know what they catch on the Aran Islands, somebody please let me know. My dad and I quickly made it to the bike shop where a guy hopped on a new bike to deliver to Stephen down the road. Soon enough we were good to go! I led my family out to the long and sunny coastal road which was as beautiful and crowded as I remembered from last year. We swiftly sped along the pavement, admiring the green-drenched hills and ambling farm animals while dodging mini horse-drawn carriages and other bicyclists traveling slow and wide. Thankfully there were no near-death experiences like before, but I did get a pretty serious sunburn. In Ireland. Again! How?? 45 minutes of cruising later, we crashed at the local pub and downed some pints before shopping for wool sweaters at the serious Aran Islands sweater shop. Try saying that 5 times in row. With bellies full of beer and sun-kissed noses we dropped off our bikes, picked up my mom and boarded the ferry back to Galway. What a day! 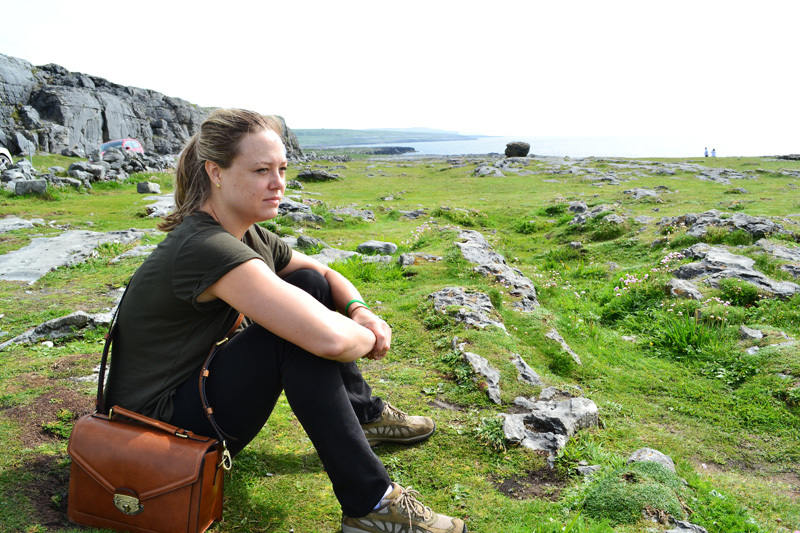 I love the Aran Islands and was ecstatic to return. It was a dream come true. Thanks to my family for trusting my crazy ideas and following me up a dirt road. As always, it was worth it. Till we meet again Inis Mor!